The land- and waterside infrastructure ensures smooth operations in the Port of Hamburg. By implementing extensive maintenance measures and innovative construction projects, we can operate a port which will be able to cope with an increasing flow of goods in the future. The port is the economic heart of the Hamburg metropolitan region. Its significance in the industrial location and North German labour market is undisputed. With the EUROGATE West Expansion Project - an expansion of the port to the west - HPA is providing the necessary space and conditions for additional, long-term handling capacities. This is an important step towards the future. The construction measures to expand the existing terminal area will create the capacities needed in the future. EUROGATE will make a decisive contribution to the competitiveness of the Port of Hamburg. The metropolitan region can therefore continue to function and profit as a hub of international mercantile trade. The project will also secure and create jobs. As part of the efficient, resource-conserving and sustainable port development, we will ensure that the Hamburg site is equipped to handle the large-scale ships of the latest generation. 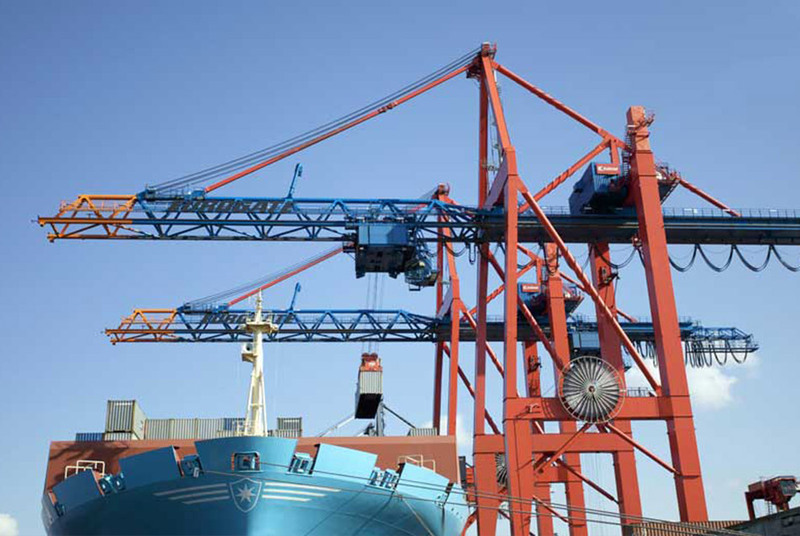 Trade with Asia and North Eastern Europe as well as increasing ship sizes are creating new demands on the handling capacities of the terminals. This is because container ships are getting bigger and bigger. In terms of ships' dimensions, the container ship fleet has changed the most in recent years within the world trade fleet. In the past 20 years, the maximum ship size has quadrupled from 4,400 TEU (1994) to around 18,000 TEU (2014). In the meantime, more than 230 ships with cargo capacities of 10,000 TEU or more are on the move and further ships of this size class are in the current order book. The largest container ships currently in service can load over 20,000 TEUs. In 2014, nearly 1,000 large-scale shipments with a length of more than 330 meters or a width of over 45 meters were recorded in Hamburg. For comparison: in 2011, Hamburg welcomed almost 300 ships of this size. The site has deep sea access for large container ships. Turning facilities are available or can be created for large container ships, which enable the safe turning of the largest ships currently in operation. Sufficiently large areas are available or can be created for terminal operations and container storage. An efficient connection of the area to the road and rail network is feasible. The HPA will create a 38-hectare new terminal area at the petroleum port. The petroleum port is being refilled and the headland restored. The existing turning circle is being expanded from 480 to 600 meters in diameter and will thus fulfil the requirements for turning large ships. A new quayside with a total length of 1,059 meters is being erected to accommodate two large ships as well as a feed vessel. The transhipment capacity of the EUROGATE Container Terminal Hamburg is being expanded to receive a total of six million standard containers (TEUs). The port of Hamburg is Germany's largest seaport, universal port and economic driver. With total cargo handling of more than 145 million tonnes in 2014, Hamburg is one of the leading container ports in Europe. Of the total volume of cargo handled, 9.7 million TEU is attributable to container handling. The port of Hamburg is therefore also of great importance for the entire national economy of the Federal Republic of Germany. The strategically far-sighted development of the port will not only benefit the economy of the Hanseatic city and the metropolitan region. The expansion of the EUROGATE terminal will also generate additional employment opportunities. Traditionally, through the reflow of funds to the budget, the Port of Hamburg has created the conditions for investments in important future areas of the Free and Hanseatic City of Hamburg (e.g. health and education). Last but not least, the German construction industry, particularly in Hamburg and the metropolitan region, will also benefit from a project of this magnitude. In 2013, the number of jobs directly or indirectly linked to the port was around 267,000. In the Hamburg metropolitan region, there were more than 153,000 port-dependent jobs in 2013, of which about 127,000 were in Hamburg. Over 57% of jobs in Hamburg, around 73,000 in total, are directly or indirectly related to working with containers. Numerous new jobs will be created in connection with the expansion of the EUROGATE network and other measures at the Hamburg site. The development of the site at the petroleum port as a container handling area will involve the expansion of the existing container terminal in Hamburg to the north-west - thus, for example, the rail and road network connections in the southeast can be used synergistically. HPA is placing a special focus on the railway as an environmentally friendly means of transport for containers handled in Hamburg. The advantages of rail transport and the potential of Europe's largest port are to be used to a greater extent for the growing container volumes. Increased use of the railway is planned for the future. Longer trains with more containers than previously will be used to reduce air emissions and the frequency of trains. This also forms the basis of the master plan for the Hamburg Port Railway, which includes the anticipated rail freight volume of the Port of Hamburg as well as the projected increased traffic of the EUROGATE Container Terminal Hamburg (CTH). In addition, the HPA has also created the necessary conditions for sufficient road traffic with various construction measures - for example, the Finkenwerderring (formerly known as the "Knoten"). Kattwyk Bridge is more than a central connection in the port area. The impressive lift bridge over the Southern Elbe has been in continuous use for almost 40 years. The planned new construction of a railway bridge will shift rail traffic and substantially reduce traffic on Kattwyk Bridge. 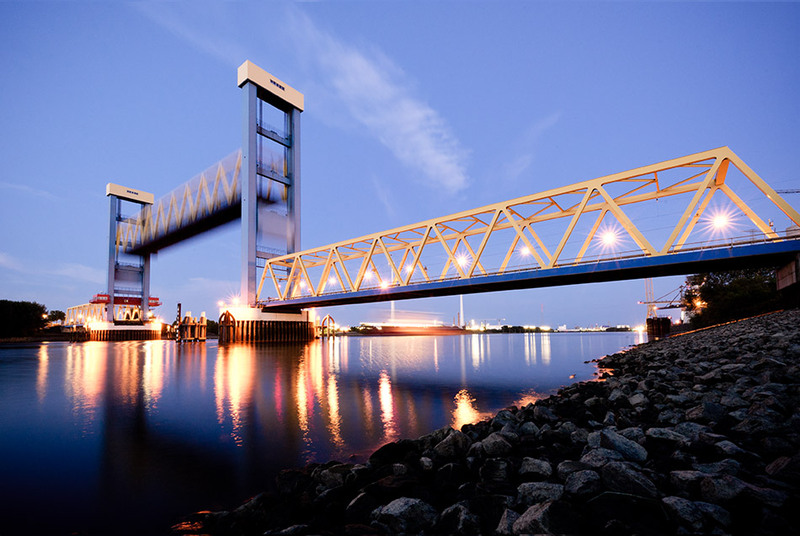 The New Kattwyk Railway Bridge (NBK) project will therefore help to sustain the flow of traffic in the port, while at the same time contribute to the preservation of Kattwyk Bridge, built in 1973, as a landmark of the port of Hamburg for a long time to come. As a central transport and strategic hub, Kattwyk Bridge serves the port railway as the most important connection between the western and eastern harbour areas. The road traffic uses the bridge as a convenient link to Wilhelmsburg and as a long-distance connection to the A7 motorway. Congestion on the Köhlbrand Bridge is partly relieved by diversions via Kattwyk Bridge. An integrated cycle route and footpath also allow you to cross the bridge without a car. Kattwyk Bridge is one of the largest lift bridges in the world and has long become a landmark of the harbour with its highly visible structure and characteristic architecture. The tried and tested principle of operation has proved its worth for decades: when a ship passes, the bridge is temporarily closed to traffic and opens partially or fully, depending on the height of the passing vessel. This operation of Kattwyk Bridge meets the needs of all road users with ever-increasing traffic volumes. Why is new construction necessary? The harbour is growing - but Kattwyk Bridge is unfortunately unable to grow. The volume of traffic is also rising steadily on the roads as a result of the growing cargo handling and port development. The rail and road network needs to be expanded to provide an efficient infrastructure and optimum flow of traffic. Kattwyk Bridge is part of this transport network: after more than four decades of operation, adapting to today's traffic conditions is essential. Due to the current high volume of traffic, this important transport junction is becoming increasingly overburdoned. The bridge is closed by passing ships for trains and vehicles for around three hours a day. It is also closed for up to seven hours by rail traffic, which has priority over road traffic. As the bridge was not designed for today's traffic loads, load and speed limits also reduce the utilisation possibilities of the bridge. For all of these reasons, the use of Kattwyk Bridge is becoming increasingly inefficient and therefore time-consuming and costly. The new bridge construction will enable rail traffic and road traffic to be separated, which will significantly reduce exclusion periods and other restrictions. The bridge construction is of course also showing the first signs of fatigue caused by decades of high loads. As a long-standing landmark at the Port of Hamburg Kattwyk Bridge needs to be preserved for a long time to come, but this can only be achieved by constructing a new bridge and relieving the strain on the older one. The new construction project (New Kattwyk Railway Bridge) north of the existing Kattwyk Bridge will be used to separate the road and rail lines and adapt the infrastructure to modern requirements. At the same time, the planned expansion will prepare the transport network for the future. The new construction is therefore a major infrastructure project and an important part of port development. As far as technological requirements are concerned, there are currently scarcely any comparable bridges worldwide. As a railway bridge, the NBK will be designed for the pressures of today's and future rail traffic. Both inner-city rail traffic and trains from Westhafen in the north-east will use the port crossing as they have Kattwyk Bridge in the past. Pedestrians and cyclists will be provided with a secure crossing over the Southern Elbe via the convenient bicycle and footpath on the bridge, which offers a great view over the river Elbe and the harbour. Kattwyk Bridge, which was built in 1973, will be reserved for road traffic. The project plans include the construction of a 287m-long lift bridge some 58m north of Kattwyk Bridge. With a clear height of NN + 53m when open, the passage height of the NBK is equivalent to that of Köhlbrand Bridge and the existing Kattwyk Bridge. As a triple bridge made of a steel lattice framework, each with an engine house for the bridge machinery on the bridge pylons, the new construction is architecturally based on the style of Kattwyk Bridge and creates a coherent overall picture. Together with Kattwyk Bridge, the NBK will form a distinctive bridge family - which is completely unique both architecturally and technologically, setting a new standard worldwide. The construction of the bridge, including the track construction and overhead lines, will also involve extensive construction work on the entire surrounding traffic system. In addition to the basic reconstruction of the Kattwykstraße/Kattwykdamm interchange with road and railways, the Neue Altenwerder Hauptdeich, Polderwände Hohe Schaar and the Sandspülfelder Moorburg Ellerholz will need to be adapted to the NBK. At the same time, the electrical and control technology of Kattwyk Bridge will be comprehensively refurbished. The implementation of the new construction in current traffic operation is a particular challenge. Due to the size and complexity of the project, technical and planning expertise and, above all, interdisciplinary skills are required to take the interests of all stakeholders into account. Current traffic reports, downloads of forms and more as well as contact persons at the HPA- here you will find everything.